With Opera Link, it's possible to get access to your bookmarks and Speed Dials everywhere. Get Opera Mini 4 beta and login to Opera Link to get your desktop bookmarks, or login to link.opera.com to access your bookmarks with any other browser. Enjoy the Rock Opera launch party , and don't forget to join the online celibrations if you can't be there. I wanted to upgrade but the tray icon bothers me. Does anyone know how to get rid of it? Uses the 9.5 beta the 9.24 preferences or the alpha preferences? what is the build no. any1 who has installed can plz tell. installed it. it is 9613. Ohhh the link.opera.com thing. Great idea. Dasch: it uses the alpha preferences by default. "what is the build no. any1 who has installed can plz tell." Looking forward for the final release!! I was really looking to use opera with "improved compatibility" but it seems, that it isn't possible. "Search" button on google' results page is badly missaligned. I find it strange that most visited page on earth wasnt double and tripple checked. Also I find it disturbing, that no mayor people pleas were fullfiled: spellchecker, autoupdate, autofill. Syncing is a nice idea, but if feels like many other Opera' stuff: unfinished. 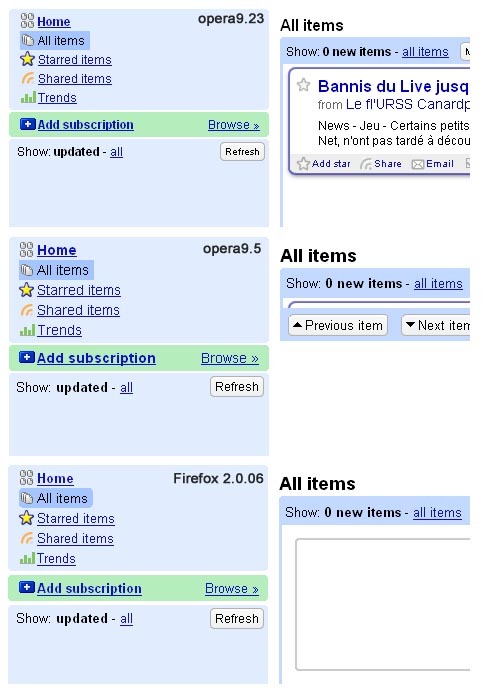 And my experience with opera says that it will be in this stage for years. Ie. like cookie editor, that misses only "multi select" to be fully operational, but it misses it for years. OTH, it feels faster than recent 9.24 version, but it isn't enough to make me drop FF. FF is so much less problem prone. It might be webdesinger' fault, but I don't really care. same question here.. what about the debian 64bit version? Rightclicking on it and selecting 'Exit' from the menu? Can you write changelog between 6913 and 6903 builds? btw, what's opera:config#Developer Tools ? opera forgets the last downloaded file. Wow, seems like i'm going to love that build. I didn't find a solution, do you wanna say that it's not a bug, but a feature? The Flash Player lets you experience animation and entertainment in your Mozilla web browser. works fine here with nsplugninwrapper on debian etch amd64 release. In contrast to v9.23 the date of the content frame is no longer overlapping the border but now the height of the content is wrong and Opera still doesn't recognize that it's a frame (by rightclicking it). Why do you always take a step forward and two backwards? Crash opera: import personal certficate (p12 format) after asking for certificate key password or simply cancel operation (Storno). In Windows XP (will try Linux, too, when I get home) Opera refuses to open local files named "index.html" by double-clicking. Focus goes to Opera, but the file does not open (not even a blank tab). If I rename the file it opens without any problems. I just tried what will happen with "index.htm". The file opens normaly in a new tab if Opera is in the background BUT if Opera is closed, it opens the file TWICE. The bug where Opera switches from my custom keyboard layout back to the default 'British' layout every time I do anything seems to have been partially fixed. This might actually make Opera usable for me again. thanks for the first beta. In Windows XP (will try Linux, too, when I get home) Opera refuses to open local files named "index.html"
btw, It crossed my mind that someone else has seen this already, but I could not find a way to check if this has already been reported as a bug... In other words "where is the bug base and is it open to the public for viewing/searching?" Btw, where is qt4 build? I hope those little things that worked fine in previous alphas are being fixed before the final release. Line spacing was fixed in early alphas, but broken again since build 9600. Depending on which option you choose in the middle dropdown list, the round selector separates from the word 'Digital'. Broken since build 9594. Showing comments 1 - 50 of 296.